The event was organized by Artha Forum (www.arthaforum.com), a community dedicated to provide healthy work-life balance and business ethics based on spiritual principles. Mr. Easan Katir a fiduciary Registered Investment Advisor. He is also the California interfaith coordinator in the HAF, and serves in the Hindu Heritage Endowment. He spoke very eloquently on virtues like generosity and treating people like you would like to be treated. He shared his experience about teaching at a youth camp hosted by Sri Venkateshwara Temple in Pittsburgh. He emphasized on opening the option of being spiritual leaders for our children rather than just being engineers or doctors. The wonderful evening continued with a thought provoking talk by Upendra M. Kulkarni , vice president of the Platform Engineering Group and director of Graphics Software Development and Validation at Intel Corporation. He explained in depth the qualities of a leader and the attributes of a spiritual person an how these both are beneficial for uplifting the society and creating a better future. He explained how the journey to make a change for betterment is never easy whether you are a leader or a spiritual practitioner. The next panelist Mr Ron Pitamber, founder and owner of the Heritage Group Hotels shared his participation in the previous Artha events and how he had gained so much from the association of such like minded spiritual practitioners . He fondly remembered his visit to the Artha event at the Govardhan Eco Village in India Mumbai and requested everyone to go visit the Eco Village. Mr Ron Pitamber shared how his family practices spirituality and mantains a balanced life. This was followed by a keynote address by H.G. Chaitanya Charan Das, a monk and spiritual author. He explained that a true leader is the one who can light the fire to achieve within. He continued his talk taking us on the battlefield with Arjuna and very eloquently explained in the depth not only the battle with weapons but also the battle the Arjuna was fighting within his mind. He explained,"That Gita uses the most, anti spiritual setting, a battlefield, a setting of war, to demonstrate how spirituality is needed even in that setting. He further explained that "Before Arjuna could fight the outer war, he needed to win the inner war between his emotion and his reason". Chaitanya Charan Das, raised many thought provoking questions and left the audience with a desire for deep introspection. Mr. Kulkarni asked during this talk “Though I am a panelist and am expected to answer questions, I would like to ask Swamiji a question: Spirituality is about compassion, whereas business is about competition. How can the two go together?” This question was addresssed by H.G. Chaitanya Charan prabhu quoting the Gita concept of the three modes, and how competition can be in three modes. Competition in ignorance is about succeeding by destroying one’s competitors, whereas competition in goodness is about using the presence of competitors to bring out the best in oneself. When Chaitanya Charan prabhu explained the different types of competition and how spiritual wisdom can foster a culture of healthy competition, Mr Kulkarni as well as others in the audience clapped in applause. The talk was followed by an interactive session with H.G. 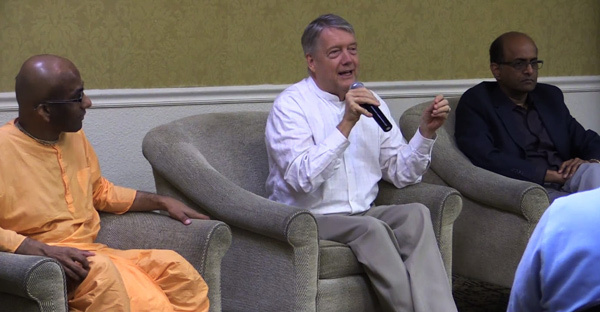 Chaitanya Charan Das and all the other members of the Panel.